August 6, 2014 – Portland, Ore. – In response to the recent shootings in Portland, community activists Jason Washington, of Brothers Gaining Equality Through Excellence, and DeMarcus Preston, a former gang member, decided to gather a group of people for a bike ride to “take back the streets.” They reached out to the Community Cycling Center for support. This collaboration sparked a robust and powerful grassroots movement. 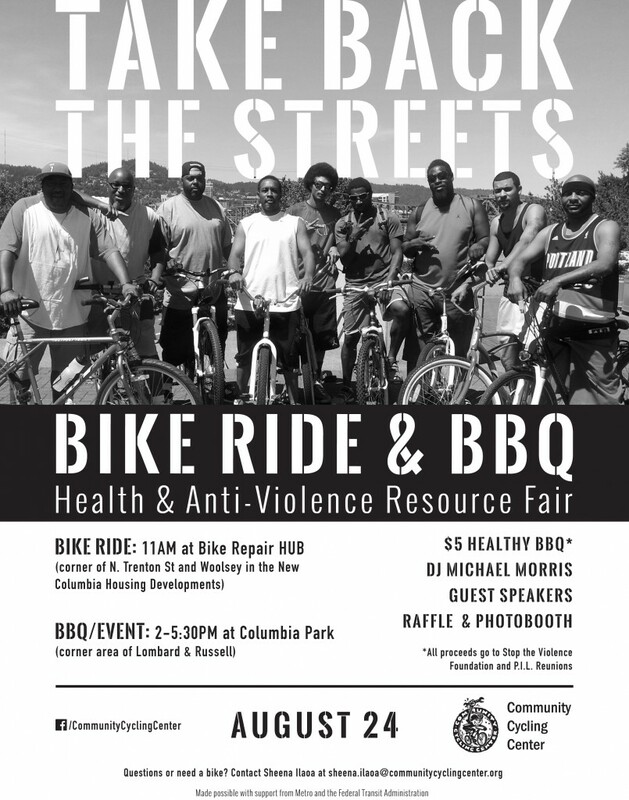 On Sunday, August 24th, the group will begin their bike ride at New Columbia’s Bike Repair Hub and end at Columbia Park. After the ride, the event will proceed with a short documentary about life after incarceration, guest speakers, musical entertainment, and a healthy barbecue. At the event, several organizations will provide resources on health, gang prevention, after school programming for youth, transition services, and more. When: Sunday, August 24, 11am-5:30pm. Bike ride begins at 11am at New Columbia’s Bike Repair Hub, located on the corner of N. Trenton Street and N. Woolsey Avenue. Event will begin at 2pm at Columbia Park. Healthy barbecue will be offered for $5 a plate. All proceeds will benefit Stop the Violence Foundation and P.I.L. Reunions. Teressa Raiford Mazique, CIO of World Arts Foundation Inc. Questions? Interested in tabling at the event? Contact Zoe Piliafas, Director of Programming, at zoe@communitycyclingcenter.org. The Community Cycling Center is a nonprofit organization founded in 1994 that helps people access their community by bicycle. We partner with communities on neighborhood-based projects and programs. We believe that all Portlanders—regardless of their income, education, or ethnic background—should have the opportunity to choose healthy, active transportation.